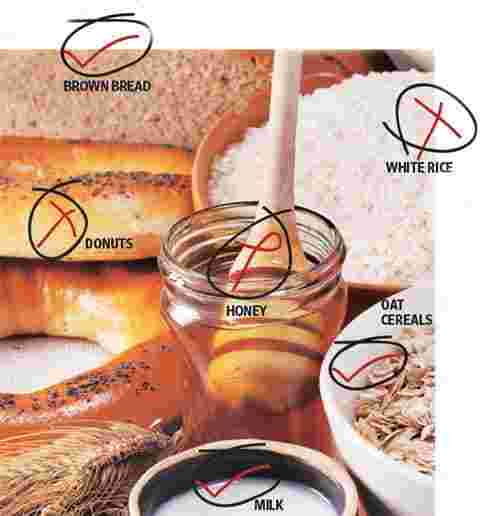 Brown rice for white rice, honey instead of sugar, wholewheat bread instead of white bread—advice on how best to eat to minimize weight gain (or lose weight) and keep lifestyle diseases at bay is so plentiful that it can be confusing. What’s the right mix of proteins, carbohydrates, fibre and fats? The latest addition to the growing body of research on weight management and good eating habits, published in the The New England Journal of Medicine in November, pins it down to a high-protein and low-glycaemic index (GI) diet that not only helps weight loss, but also works better in maintaining the ideal weight, without taking away any of the essential nutrients needed by the body for healthy functioning. High protein is easy enough to understand (load up on lean protein such as chicken, egg whites or fish), but GI is tricky. Basically, GI is a quick measure of how different types of carbohydrates affect the blood sugar levels in the human body—foods with low GI contain carbohydrates that take a longer time to break down in the body, keeping a person satiated for longer, without significant insulin spikes; foods with high GI are broken down rapidly by the body, causing a sharp spike in insulin levels, and inducing more hunger. “The Indian diet is very carbohydrate oriented—about 50-60% of each meal on an average comprises carbs," says Pradeep Talwalkar, senior consultant diabetologist at the SL Raheja Hospital (Fortis), Mumbai, “so GI comes in really handy to calculate whether a person has good or bad diet habits." “While planning a diabetic diet, sugar impact is the first consideration," says Shikha Sharma, a Delhi-based wellness consultant. “GI is like a ready reckoner for that impact. Lots of people think that Marie biscuits are all right for diabetics, but anything with refined flour or sooji (semolina) in it will throw up a high-GI value." GI values for foods are calculated against a maximum value of 100, which is assigned to glucose. 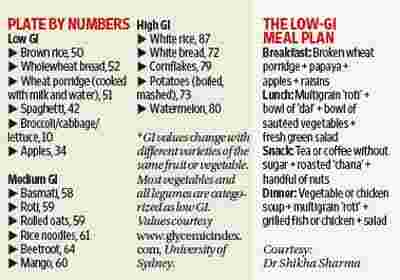 Foods with GI values lower than 55 are categorized as low GI, and include most vegetables (except beetroot, potato and pumpkin), foods between 56 and 69 on the GI scale (bananas, mangoes, oat porridge) are labelled medium GI, and anything above 70 (cornflakes, white rice, cakes, French fries) is in the high-GI zone. Taken on their own, GI values can be confusing—watermelon, for example, has a GI value of 78, a very high reading if seen in isolation. But for every 200g serving of watermelon, only 10g is made of carbohydrates, which means the effect on blood glucose levels will be negligible. “You have to factor in a lot of other things along with GI to understand the true impact of carbs on your body," says Dr Talwalkar. “The GI of white rice is between 70 and 90. When you cook it, the amount of water absorbed by the rice will change its GI value. What you eat the rice with will also affect the GI, but from that number you do get an idea of how it will spike your blood glucose levels." How a food is processed can greatly change its GI value—raw carrots have a very low GI of 16, but boiling them raises the value to 49. Removing fibre and processing starch also makes a big difference—baked potatoes have a GI value of 60, but boiling and mashing them, thereby breaking down the resistant starch, raises the value to 73. “When you drink fruit juice instead of eating the fruit, the GI value goes up because the fibre has been removed," adds Dr Sharma. Refining processes have a larger impact on GI values than cooking, because complex carbohydrates are broken down completely while refining. Brown rice has a GI value of 50, which spikes up all the way to 87 when it’s polished and refined into white rice. “Refining carbohydrates makes them extremely easy to digest," says Soly James, dietitian at SL Raheja Hospital, “and leads to an instant spike in blood sugar. It also takes away vitamins, minerals and fibre, making it very non-nutritious." One myth the GI shatters is that honey is better than sugar—both register values of over 80 on the index. “Irrespective of the source, sugar is a problem," says Dr Sharma, “refined fruit sugar or malt sugar or honey has the same effect as normal granulated sugar. Cut down the sugar content in cakes or breakfast cereals by adding more raisins or figs." Keep in mind that GI does not reflect the nutritional aspect of the food, or the amount of carbs that it contains per serving. “So while it’s a good idea to restrict high-GI foods such as white bread, nutritional values should also be kept in mind to make a balanced diet," says Dr Talwalkar. “Frying, for example, brings down GI values," says James, “because fats make it harder for carbohydrates to break down, but that does not mean it is better to eat fried food. Caloric intake and nutritional values always have to be taken into account." “Add different types of grain flours to bring down the GI value of your roti," adds Dr Sharma, “adding a little soy flour to the wheat flour, for example, will add protein and cut down carbs, thus lowering the GI. Add vinaigrette dressings to your salads, or lemon juice to boiled potatoes, because the acid slows down digestion and reduces the blood sugar spike."